As you all are aware, this year we have been to a few great properties all over India. 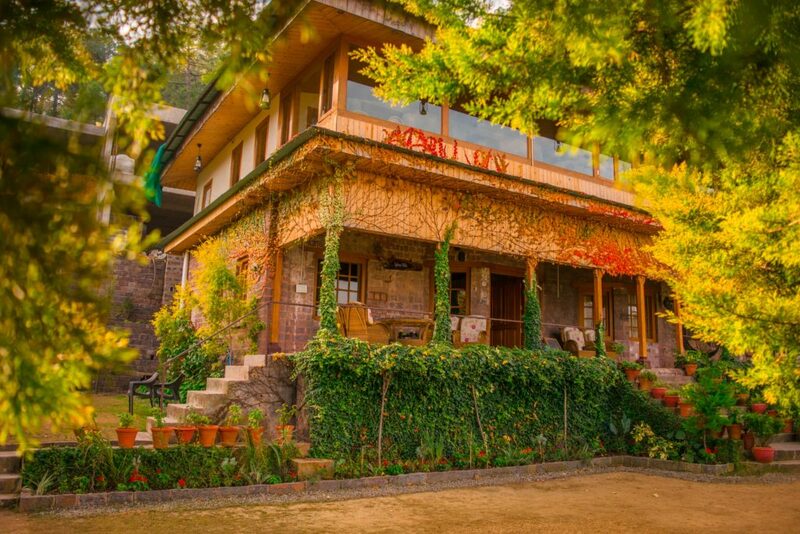 And while we did say that The Pahadi Organic in Uttarakhand was our favorite till now, Sylvan Villa is certainly the best place we have been to in Himachal Pradesh. We can’t really compare these properties because while one gave us an amazing Kumaon experience, the other was a place straight out of a fairytale. We are so glad that we collaborated with Stay on Skill and got a chance to stay at these amazing places. It was a truly unique and eye-opening experience and we look forward to more such collaborations in the future as well. Full Disclosure: We were offered a 2 nights 3 stay day at this wonderful property in Dharampur in exchange for an honest review. Honestly, the place and the location, both were fantastic and this villa is a great getaway for families and groups. You get the entire villa to yourself to use and have a really amazing view to accompany it. Magical setting with a mesmerizing backdrop, that is what Sylvan Villa is all about. This fairytale-like home in Dharampur is situated at a height of 4,830 ft. above sea level and is quite well-known for its history and culture. The property was previously a school during the British time and is said to be 100 years old by some historians. In fact, it is supposed to be the first school in Dharampur and there are a few oldies who come here every now and then to reminiscence their school days. And you can actually feel the old world charm here in the setting of the gramophone, charkha, old rocking chair, and so on. The decor here will make you feel like you have been transported into the colonial period. This place is truly vintage but not just from the inside, from the outside too. You have a properly maintained garden here, surrounded by trees, and the villa itself is covered with leaves and vines which gives it a complete other-worldly feel. 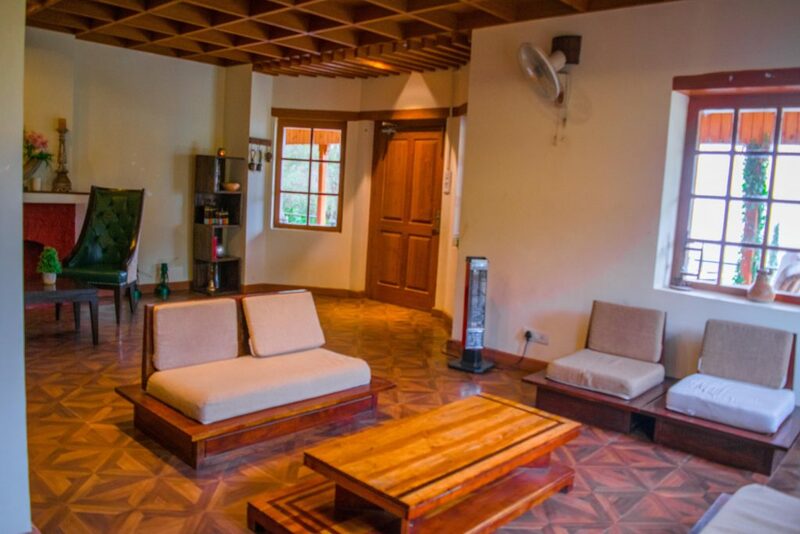 Trust me, if you wanted to experience a luxurious stay at a vintage house while enjoying the quiet and peaceful environment then Sylvan Villa is the place for you. 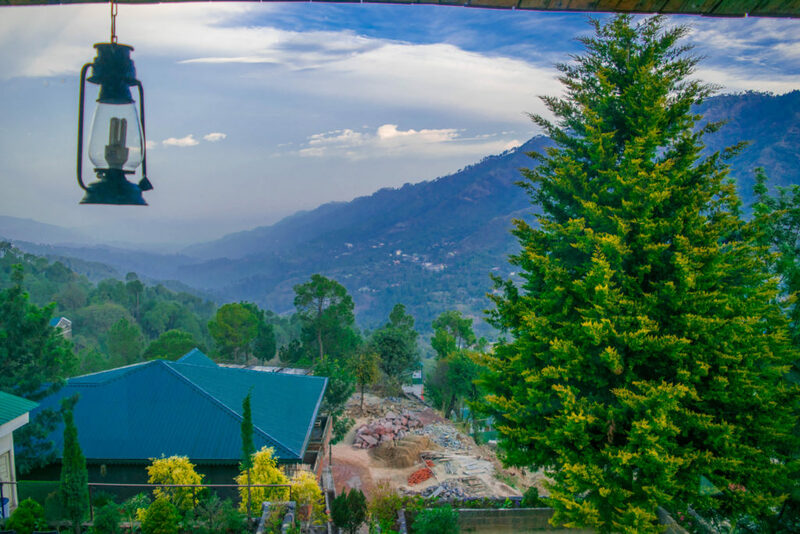 Sylvan Villa, located 1.5 km from the Dharampur center, is perched on a hilltop from where you can admire the gorgeous mountain view. And if you are in one of the first floor rooms, then you have a panoramic mountain view every morning from your adjoining balcony which is pretty amazing. It is close to the local market but far enough to keep you protected from the town hustle bustle and is a great place to relax. It is around 1 km from the Dharampur Railway Station and 2 km from the Dharampur Bus Stand so you won’t find trouble in terms of accessibility. But since it is situated on a height, you will actually hear the birds and crickets chirping which can be really therapeutic. Honestly, Sylvan Villa is located at a nice, secluded spot and is the perfect place to get away from the fast-paced city life and loosen up for a little while. You can walk barefoot in the garden here or simply sit in the verandah to enjoy a nice cup of coffee/tea while enjoying the natural sounds around you. Although Sylvan Villa is not hard to reach, it might be slightly difficult to reach because it is not available on Google Maps (I don’t know what’s up with Google because I have certainly tried to add the place). However, don’t be disappointed because here, you will find clear and easy instructions to reach this place. Before you make your way to the Sylvan Villa, you have to reach Dharampur first. One thing to note is that there is no direct train or bus to Dharampur so, you have to either reach Solan or Kalka to move on to Dharampur. If you have your own vehicle or if you are planning to rent a vehicle then you can directly reach Dharampur. From Delhi, Dharampur is approximately 280 km so it will take you 6-7 hours to reach. Once you reach Dharampur Railway Station, get off the Kalka-Shimla Road and take a left turn. Carry on this road till GL Public School and then take the right fork, which you will find just opposite to the GL Public School. After 500 m, you will have reached your destination. If you are taking a bus then you can take a bus to Solan which will take about 8-10 hours to reach. You will get several HRTC buses going throughout the day which will cost you anywhere between 350 – 800 INR, depending on your bus type. Once you have reached Solan, you can take a local bus to Dharampur which you will get in every 30 minutes. Solan is around 17 km from Dharampur so it will take you about 35 minutes to reach via bus and will cost you about 20 INR. After reaching Dharampur bus stand, make your way to the railway station and then keep going straight until you reach the GL Public School. Enter the gate opposite to the GL Public School which goes straight again and you would have reached the destination. If you don’t want to be cramped up in a car or a bus for your journey, then the train is another great way to reach Sylvan Villa. First, you will need to reach Kalka Railway Station and from there, you can take a toy train to Dharampur Railway Station. You can also take a bus from Kalka to Dharampur, it will take about 1 hour to reach and will cost you 50 INR. But if you want to experience the toy train then this is the shortest distance for you and it will cost you just 30 INR. It will take about 1 hour 30 minutes to reach via toy train. Once you have reached the Dharampur Railway Station, get out on the main road and then take the left and reach GL Public School. Technically, you can visit throughout the year here. But, if you want clear skies and want to enjoy the mountain views properly while escaping the summer heat, then summer season is a good time to visit Dharampur. From March to July, the temperature stays cool here with sunny days which makes it a great weekend getaway. But if you don’t mind a little cold then October – December could be a great time too as you get to witness the autumn colors here. There are 3 rooms available in the Sylvan Villa, all of which are spacious and luxurious. There is 1 room on the ground floor and 2 rooms on the first floor. Each room has a huge double bed, a large dressing room, and a kickass bathroom. The dressing room has cupboards for you to store your luggage and a big vanity mirror to help you get ready. And the washroom is huge with a washbasin, English toilet, and a glass-enclosed bathing space. The first room floors also have a combined balcony which offers the most magnificent view of the mountains and is decorated beautifully with the lanterns. There is also a small seating and a table set up here where you can have your breakfast or you can work while enjoying the views. The ground floor room has the verandah which is beautifully decorated with plants and flowers and there is a seated swing for you to enjoy the view from. Each room is also beautifully lit up so that when you look from the outside, the effect is completely magical. Now that we have described the amazing rooms here, let’s talk about other services and ammenities that you can use here. Well, as mentioned, you have a balcony, verandah, and a huge garden at your disposal so you can work, play, do whatever you want here. You also have a kitchen attached to the dining room where most of your meals would be served, is not specified otherwise. You can ask the chef (Govindh) or the caretakers (Rasal and Sunita) to prepare snacks for you when you feel like eating. Or you can prepare something yourself too if you so wish to. There is also a living room with 3 sofas for use where you can watch the TV and just spend some time playing games or interacting with each other. And each room has a Heater so if you feel cold, you can just turn it on to feel warm and toasty again. Also, they have a portable WiFi device which you can use to complete your work. Overall, we loved the hospitality at this place and we definitely felt well-cared for during our stay here. Rasal and Sheetal made sure that we didn’t feel the need of anything and were ever-ready to help with any requests that we had. In regards to food, the menu at our time was simple since we were only two people and couldn’t tell them beforehand what we would like to eat. But that doesn’t mean it lacked in taste or quantity. I especially loved the Dal Makhani and the Chicken Curry prepared by the chef here and Radhika really loved the Aaloo Gobhi that they had specially prepared for her. There was also Paneer ki Bhurji which was delicious and the Aate ka Halwa, in the end, was completely mindblowing. We actually ended up eating the entire big bowl of the halwa. We also had Gulab Jamun and Chocolate Ice Cream as dessert for other meals which was equally delicious and mouth-watering. You also get delicious Paranthas in the breakfast and can order snacks like Sandwiches, French Fried, Pakodes, and so on here. Although relaxing and chilling should be your main priority in Sylvan Villa, it doesn’t mean that you cannot keep yourself activity with some sightseeing and fun activities. Here are a few things that you can do around here to keep yourself occupied. The town of Kasauli is just 15 km away from Dharampur so you can go for a day trip here via bus or your own car. You will find several buses going to Kasauli throughout the day which will take 30-40 minutes to reach and will cost you 20 INR for the journey. In Kasauli, you can roam around the market and go to the viewpoints to click some photographs. 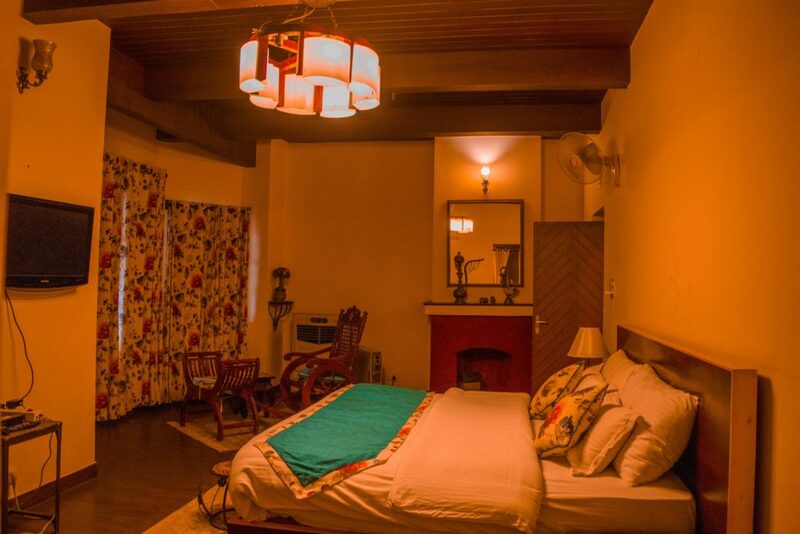 And then, in the evening, you can head back to Dharampur and relax at Sylvan Villa. Another thing that you can do is go to the pine forest behind the Sylvan Villa. There is a small trail beside the villa which goes to the forest and is a great place to meditate or click photographs. You can just take a walk and enjoy the peace and quiet here. If you don’t mind walking a little then you can walk further from the pine forest to the nearby Railway Station where many toy trains pass through the day. You can walk on the railway tracks and reach the Dharamshala Railway Station from here which will make for a good activity. There is also a small park at this railway station so you can sit here and watch the trains pass by too. Honestly, Sylvan Villa is a goldmine for photographers and models because there are so many places to click amazing photographs. You can click some beautiful pictures in the garden or the verandah or on the first-floor balcony. Trust me, there are numerous ideas to execute here, you just need to have a creative imagination. We found several unique spots for amazing photographs but we are not going to tell you, you have to find them yourself. As mentioned earlier, Sylvan Villa has a big garden so you can play games like badminton, football, cricket, etc. here quite easily. So, if you are with your friends or family here, you can enjoy a nice staycation here without having to wander off too much. And last, but not the least, you have the amazing mountain views to keep you occupied. Trust me, once you start admiring the views from this villa, you will easily lose the sense of time and won’t need anything else to keep yourself occupied or entertained. So, just get your camera and shoot away or relax on a seat and take in the view around you. Both Radhika and I loved our time at the Sylvan Villa, the location was fantastic, the property was gorgeous and the staff was amazing. We walked a lot when we were here and it was such a welcome change from our sitting-on-our-asses city life. The air was fresh, crisp, and cool here which further enhanced our experience. When we reached late on our first day, we didn’t even bother with food and started clicking photographs because the view was so gorgeous at this time. And Mr. Rasal and Mrs. Sheetal were really caring and made sure that we were warm and properly fed. They got us a plate of Pakodas which we gobbled up in just 5 minutes and cups of hot lemon ginger tea and milk tea to keep us warm. The room itself was huge and cozy and made us feel like jumping on it (which we eventually did). And honestly, we slept quite soundly here too which was an achievement for us. The mornings here were quite amazing too because the entire sky would clear up, giving us the view of the valley. And the hot Paranthas in breakfast was seriously mouthwatering. Our entire stay here was comfortable and luxurious and we are so glad we got the opportunity to stay at this awesome property. If you are also looking for a quiet staycation at an offbeat place in Himachal Pradesh then Sylvan Villa is the perfect place for you. Do let us know in comments if you have stayed here or are planning to stay here anytime soon!